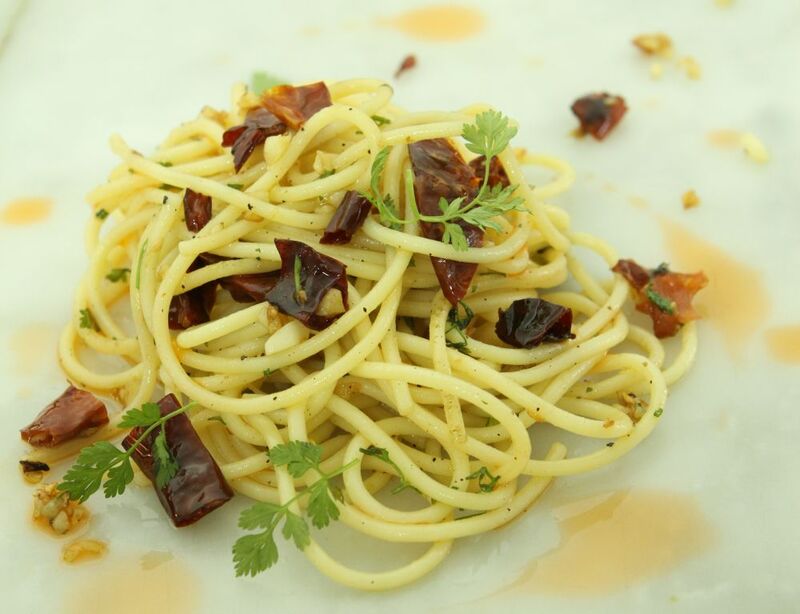 This Prawn Oil Aglio Olio Pasta is a great quick fix for last minute guests or dinner parties. This recipe was first published in Flavours magazine. Preheat oven to 140°C. Place prawn heads and shells in small saucepan, pour red palm oil over and cover pan with a lid. Simmer for 2 hours. Allow to cool, strain the oil and pour into a bottle. Chill. Cook pasta according to packet instructions. Toss with a little prawn oil after cooking and set aside. Heat half of the rest of the oil in a wok. When it starts to smoke, add garlic and chillies and stir-fry over medium heat till aromatic. Add the cooked pasta and stir-fry over high heat till pasta is well-coated. Season to taste and add the parsley or coriander. Sprinkle with Parmesan and serve immediately.